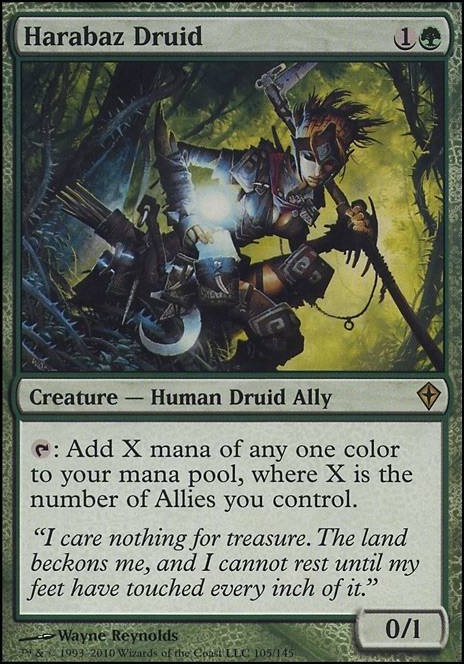 Tap: Add X mana of any one color to your mana pool, where X is the number of Allies you control. doc_brietz Give that a spin and see how it goes? Potentially you could cut Mikaeus for the Mirrorweave, since if Mirrorweaving and Polymorphous Rushing are common plays of the deck then you'd lose the benefits of undying anyway. I feel like the Mirrorweave wouldn't work as well because opponents also get to benefit from the transformation, whereas with Polymorphous Rush it doesn't work on opponents' creatures, and you get to choose a different creature for each copy of Polymorphous Rush. scotchtapedsleeves I was initially running Demonic and Vampiric Tutors, but cut those since the deck needed slots in a few categories, and opted to go for more cantrips for the experience of explosive draws with Zada et al., and also for the variance of winning with different cards every game. I did add Green Sun's Zenith and Wargate since they double as very efficient ramp spells, with 3 mana putting into play Harabaz Druid, Bloom Tender, and Gaea's Cradle. Heya, nice deck! I like the offensive power it offers. One option that might be better that Ghostly Flicker for you is Eerie Interlude. 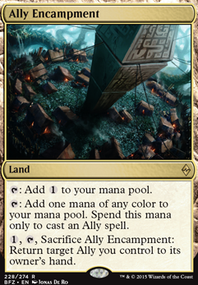 It allows you to flicker your entire field, giving you a lot of simultaneous ETB effects. Also, do Ghostly Prison and Propaganda do much work for you? With how good of a board state this deck can get, it doesn't seem like you should be worried about too many enemy creatures swinging in. You could probably remove them to make way for other cards. Have you thought about splashing some Green? I can think of three Green cards that might work well with this build. First, Harabaz Druid gets you lots of mana quickly, so you can get an extra or bigger Turn 3 play. I would say add 4 and remove the 4 Expedition Envoy. 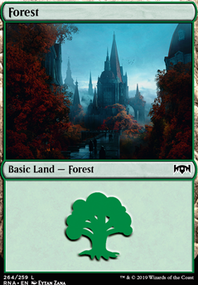 Since you have so many creatures, Descendants' Path might be a good addition. 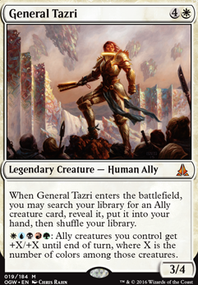 Because the deck lacks draw power, it gives you the opportunity to get more creatures on the board, and activate your Ally abilities. Phantasmal Image will whiff, though. Finally, Bring to Light is incredibly useful because it gives you the chance to tutor for any Ally or Instant/sorcery in the deck. Bring to Light is also handy because you can add 1 copy of other situational cards that you want access to, but don't necessarily want 3 or even 2 of in the deck. 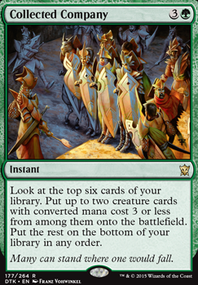 For example, if you add even 1 copy of Rite of Replication to the deck, you can cast it with Bring to Light and pay the Kicker cost separately after casting it for free - great way to end the game if you have an Excavator on the field and a Druid to pay the mana. elgosu1337 on Advertise your COMMANDER deck! Writing up a comment on your deck WarriorMagic. Made extensive changes to this deck since my previous post a few weeks ago, and it's even more fun now with lots of different ways to win. 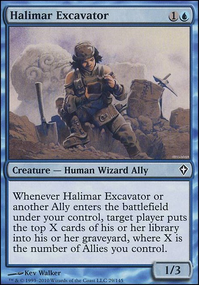 Polymorph puts all creatures from your library into play to trigger Ally ETBs. Fiery Gambit lets you flip coins to burn opponents out or draw lots of cards and untap your lands. Polymorphous Rush adds a new dimension to the deck, comboing with Silverfur Partisan for an explosive number of Wolves, and creating unexpected synergies with cards already in the deck like Harabaz Druid and Reef Worm. Zulaport Cutthroat works great with and without Polymorphous Rush since the deck kills its own creatures. Looking to include a few of the cards in the last section of the description like Graceful Reprieve, Reincarnation, Accelerate, Twinflame, Nivmagus Elemental, Jwari Shapeshifter, Chasm Skulker, Mitotic Slime, and Xenagos, the Reveler, so any suggestions for cuts would be great. You could use Aether Vial or Cloudshift in addition to Captain's Claws to get triggers from you Allies, especially Kabira Evangel. 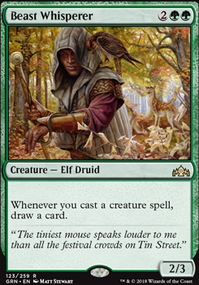 I would move Tajuru Archer into the sideboard in favor of the lower CMC and more often useful Harabaz Druid. A couple Sunpetal Grove would probably be good. Sundering Growth in the sideboard. You could run Harabaz Druid. I know it's a two drop dork, of which there are many, however it taps for any mana and becomes value with Beastcaller Savant. Harabaz Druid is for all ally decks since it is the best ally in the game. What you take out is the 4 Bojuka Brigands since they cannot block and are overly redundant. You do not need Collected Company for it. It ramps you so turn 3 you can put out more allies since you will have 5 mana rather than 3. If neither you or your opponent find Harabaz Druid exciting then you will win. In reality this creature will likely be keeping Fatal Push off your other allies. 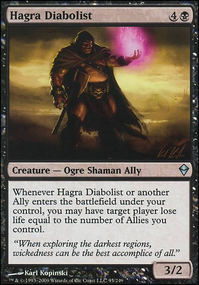 If nothing else compare the really money cost of the allies: Harabaz Druid is one of the most expensive Because it is good.